Would anyone be willing to help me understand the motion of Camera1 ? I want to orbit an object the camera is pointing at in a scene. Suppose I want a two-second animation showing a turntable view of a cube. 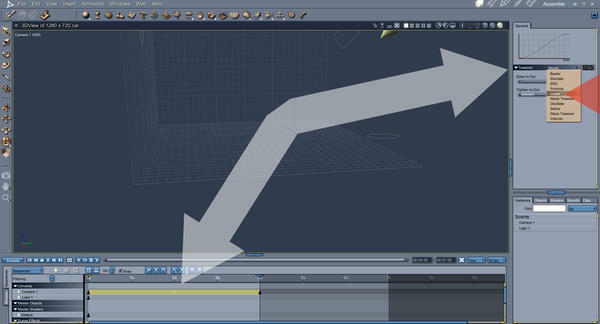 If I leave Camera1 alone I can rotate the cube, advance along the timeline, rotate a bit more, etc. But if I leave the cube alone and try to orbit it with the camera by using the trackball (dolly), it looks fine while I'm setting it up: the cube stays within the production frame and I expect to be able to render an orbit of the cube. But when I press Play - the cube sweeps around towards or away from the camera and out of the production frame. Or do tweeners come into this? It seems a pity that what looks like a preview when using the dolly isn't OK on playback. "Tweeners" are the frames between Key-frsmes, so, Yes,. they are involved here, but just a wee bit. If you Insert a target helper object place it where you want to rotate around,... position your camera as you want it,. then Drag the Camera1 (name) in the Scene, Instance list, (bottom right panel) and drop it onto the Target helper Object (name) in the list,.. The Camera becomes a "child" object of the Target helper "parent",... meaning that if the "Target helper" moves, then the "Camera" has to move with it. Now you can add a "Spin" Modifier to make the Target helper object rotate. Select the Target helper object,. Go to the Top right panels ,and select the Modifiers panel. Click the little + button,. and select "Spin". The default speed is one cycle per second. you can change that to something like 0.25, for a four second rotation. Once you've set the Speed of rotation,.. The camera should be spinning perfectly. You could use other objects as a "Parent" for the Camera,. (as long as you make them invisible for the final render) but a target helper object is simple,.. and doesn't render. you beat me to it.. .. again. Hey Dart, it sounds to me from the description that it's not the bezier tweener. It would be the same issue with the Linear tweener. The issue is the shortest distance between two points is a straight line. Carrara is moving the camera in the most efficient method between the four key frames. Both Andy's and Andrew's methods- move camera hotpoint or parent camera to target helper object and then the spin modifier for both options would be the fastest and smoothest way to go. Today was a strange one. Barely being able to check back here... and things got a bit exciting for me... so all I wanted to do is get back here, but I kept getting hauled away... argh! Hi head wax - good to see you posting again :) I was worried that the oz fires had got you! Hi, following the mini tutorial by 3DAGE, I made this little movie. I added items to show various objects in space, as mentioned in the tutorial the camera follows the spin rotation of the target helper object (positioned in the middle of the scene, just below the icosahedron). I know, it's a small thing, but I'm like a sponge: I follow constantly almost all posts, learn, I understand (or not :P ), do experiments, I try and try again. :cheese: and I would like to thank to all of this fabulous community for the great work. Many thanks for all your helpful replies. Tutorials, screenshots, example animation - thanks for the trouble you went to. I thought when posting that it would be a one-line answer (use 'point at' - which is greyed out for me - or something similar). The solutions are very clever - I need to get these nailed because I often want to see the small things I've done in turntable view and it has always proved baffling. You'll be amazed at how quickly all of this becomes a second nature flick of the wrist, sort of thing. I've had the experience of helping people use bespoke Windows programs for data entry. When I showed that they could tab from one field to the next, instead of clicking with the mouse to get there, they were delighted not to be doing an extra million mouse clicks a week. That isn't meant to be patronising - my job at the time was giving assistance and Windows was quite new to many people. The reason I'm recalling it is the thought that, in Carrara, I'm probably missing loads of efficient (or even elegant) ways to do things! Must re-visit Phil's training DVDs! So must I! There must be stuff that I have forgotten... To come back to your original issue, using the camera parented to a target helper would be the way I would do it. You can use this technique to get some very complex motions very easily, and even parent one target helper to another for very complex motion paths.